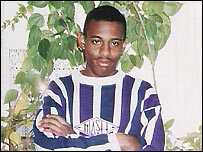 Black teenager Stephen Lawrence was murdered in 1993. His killers have never been convicted. Despite an extensive reinvestigation, the Crown Prosecution Service has announced that no more charges will be brought over his death. But despite the lack of justice for his family, Stephen's death did lead to a watershed in British race relations. BBC News Online looks back at the chain of events. The 18-year-old A-level student was fatally stabbed at a bus stop near his home in Eltham, south-east London in April 1993. A 1997 inquest ruled he had been "unlawfully killed in a completely unprovoked racist attack by five white youths". What happened in the original investigation? The original Metropolitan Police investigation - found by a later inquiry to be racist and incompetent - did not lead to any prosecutions. But the family doggedly pursued the case and eventually five young men were identified as suspects. Who were the five suspects? In 1993, Neil Acourt and his brother Jamie, David Norris, Gary Dobson and Luke Knight were arrested. Proceedings against Jamie Acourt and David Norris never went to trial. In 1996 Neil Acourt, Mr Knight and Mr Dobson stood trial for murder but were acquitted after the judge decided the evidence of witness Duwayne Brooks - Stephen's friend and with him at the time - was unreliable. In the case of Gary Dobson, a later Kent Police report said four adults had confirmed his presence elsewhere on the night of the murder. All five have consistently denied the allegations made against them. A reinvestigation was launched in February 1999 - but this has also now led to no charges being brought. The CPS said there was not enough new evidence to go to court. What effect did the inquiry into his death have? The inquiry into the failure of the original police investigation to find and convict Stephen's killers, headed by Sir William MacPherson and which reported in 1999, became one of the most important moments in the modern history of criminal justice in Britain. Famously concluding that the force was "institutionally racist", it made 70 recommendations and had an enormous impact on the race relations debate - from criminal justice through to all public authorities. Scotland Yard has made numerous changes in an attempt to stamp out racism, and all public bodies are now obliged to promote equality and tackle discrimination. The government has also tackled the double jeopardy rule which states that, in English law, anyone cleared of a crime in court cannot be retried for the same crime at a later date. Now they can be, if significant new evidence emerges. A lot of campaigners say the system is still failing minority communities. The aftermath of Stephen's murder marked a low-point in relations between ethnic minorities and the police, something which senior officers say they are still trying to rectify. Black people are still far more likely to be stopped and searched by police than white people. Black men are also disproportionately over-represented in the prison population compared to white men. Last year the commander of the Metropolitan Police's anti-racist unit said the force remained institutionally racist, despite a "sea-change" in its attitudes and behaviour. Stephen's mother Doreen said she was "devastated" by the decision, which "shattered" any glimmer of hope she had left. In a statement read out on her behalf by solicitor Imran Khan, she said she was angry that it had taken so long to come to this conclusion. She also felt bitter that while Stephen's death had led to many positive changes to the British criminal justice system, the family had not itself been helped by them. "The irony is that society has benefited where we have not," she said.